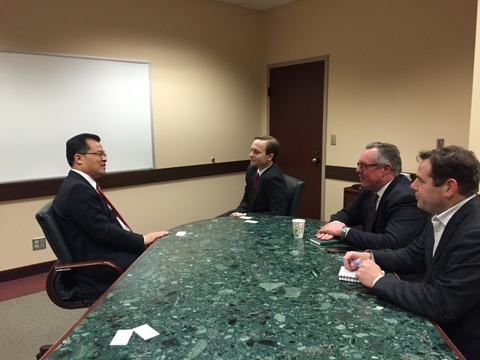 On January 11, Chinese Consul General in Chicago Mr. Zhao Weiping paid a call on Mr. Brian Calley, Lt. Governor of <?xml:namespace prefix = "st1" ns = "urn:schemas-microsoft-com:office:smarttags" />Michigan, in Lansing, Michigan to exchange views on advancing the economic relationship between China and Michigan. Chief Executive Officer of the Michigan Economic Development Corporation Steve Arwood was present during the meeting.